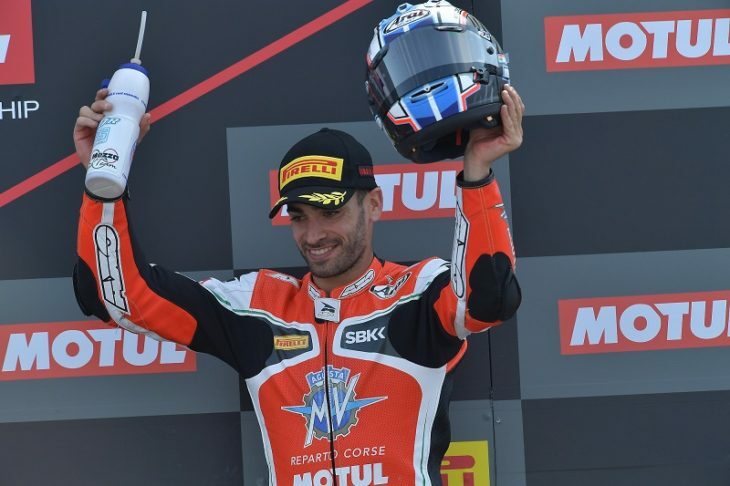 Cold temperature and clear sky welcomed the second and final day of racing on the Assen TT Circuit, with Raffaele De Rosa taking the 3rd place in WorldSSP after an exciting race, taking also the first seasonal podium for his MV Agusta Reparto Corse by Vamag Team. In WorldSBK Jordi Torres makes a good comeback and finishes 6th, the best 2018 result for his squad. In the Warm up the MV Agusta Reparto Corse mechanics worked hard to fix the problem at the front suffered by Jordi in Race 1. The Spaniard started the Race 2 from the second row in the grid, because of the 9th place in Race1. When the lights turn out, Jordi makes a good start and at the first corner he is fifth, but then loses some positions in the battle that breaks out along the first laps. At the end of the race, thanks to some good passes, Jordi will manage to comeback several positions, going to close 6th after a long fight, in front of Marco Melandri. After taking the 3rd position on the grid in the Tissot-Superpole2, this morning Raffaele De Rosa set the second-fastest time in the WorldSSP Warm up. When the fourth round of the WorldSSP World Championship kick off, Raffaele loses some positions but he is quickly into the Top5 and after a few passes takes the second position behind Jules Cluzel, even managing to overtake him on lap 14. After a long and close bagarre with Cluzel and Krummenacher, De Rosa closes 3rd, taking the first podium of the season for his team. Ayrton Badovini bridged the gap accumulated in the first part of the race, ending up in 11th place and missing out the Top 10 for only one position. Jordi Torres – Today it was quite a good one for us, I didn’t have the same problems I met in Race1 and I was able to push stronger. I passed several riders but I was suffering a bit ‘in the last corner, losing part of the advantage. All in all, we collected a lot of data and this will help us in setting up the bike ahead of the next races. I am confident we can further improve starting from Imola. Raffaele De Rosa – I’m really happy. At the beginning I lost some positions but I reacted immediately. After about three laps I tried to set a fast pace and I managed to pass in second place. Both Cluzel and me have set a good battle, I also tried to pass him but in the end I am happy with this second place. I wish to thank my team and the whole MV Agusta racing department because the bike was perfect, especially with the chassis. Now I cannot wait to get back on track at Imola, for my home race. Ayrton Badovini – I am rather disappointed by my performance in the race, I was sure I had found a good base and instead I wasn’t able to ride as I know. We have to find new solutions that will allow me to ride the way I want, especially considering the next race in Italy. I thank the team as they works really hard and I wish to congratulate Raffaele on his podium.